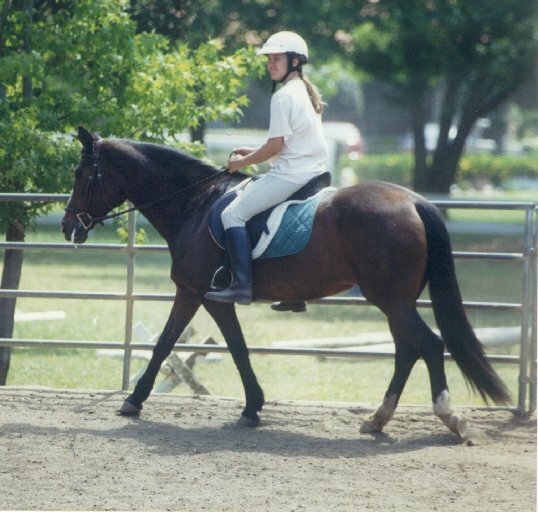 My first horse was Sher Magic, a National Show Horse – an arab/standardbred mare. Sher was 19 when purchased for $200 from a gal who, I later learned, just wanted to get rid of her. “She’s a great school horse for a beginner rider…” I hadn’t ridden since in my teens so a gentle school horse was a good idea. In my mid 30’s and with a 3-year-old son, the price was right, and Sher seemed a safe bet. Wrong! She was highly trained but very obstinate, and had the most jarring jog known to mankind when you headed for home. 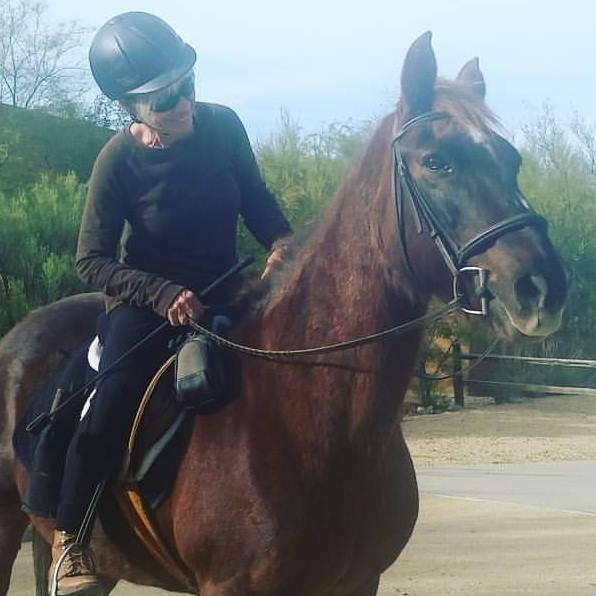 She was aptly described by a friend as “pretty for her age, but certainly no pleasure to ride.” Under saddle, she was a delight (except for that jog!) for me, but a nasty, tough mouthed old nag for anyone else brave enough to climb aboard. She did take great care of my young son as long as I was attached to her lead line. And in the end, she was my old gal. Sher finally had to be retired when she began having problems with her rear legs. One day she couldn’t get up, and that was the day the vet was called. I had her until she was 23 years old. After Sher passed, I tried a younger horse, and it didn’t work out. After several incidents, I was so badly shaken that I almost didn’t get back on a horse for the rest of my life. When I decided I DID want to ride, I went out of my way to find a good, solid animal with a lot of training and minimal vices. And one I could afford. The options? It was limited to older horses that nobody really wanted any longer. And that, for me, was the start of a very good thing. I’ve owned Thoroughbreds, Paints & even a Paso Fino. But my most memorable horses are Morgans, and yes, that’s my preferred breed. They’re not for everyone, but certainly are for me. 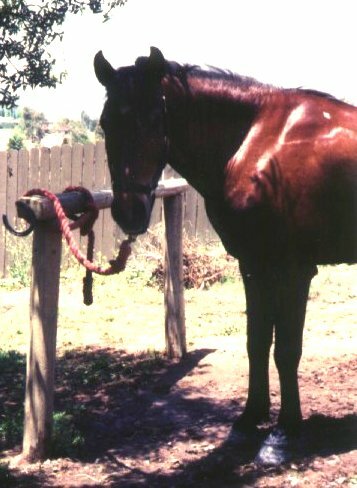 Commanche, (aka ManMan) was a Morgan/Arab gelding. He was 20 years old and he gave me back my confidence & desire to ride. He waited, patiently, until I was ready for me to improve my riding skills and then continued to take care of me. Trail rides were a delight, especially with my neighbor and her big gray gelding, Fred. Our boys were a pair. and we called them the old men’s club. I remember one time riding ManMan in our local arena. I was condescendingly told that I was cantering on the wrong lead. My reply? “You know, this old boy is 24 years old. That he can take any lead at all is fine by me.” My girlfriend hooted and with that, I knew I was back. I had ManMan until he passed at age 26. Then came the love of my life, An-Nel-Lee Hope. I got her at age 24 and my friends thought I was crazy to get a such an old horse, until they saw Hope and said “that horse isn’t 24 year old !” But she was a registered Lippett Morgan and the date of birth on her paperwork didn’t lie. Born in Vermont, her pedigree want back very quickly to many of the oldest Morgan bloodlines. She was very forward & that challenged me quite a bit at first. Yet her sure knowledge & confidence was bestowed with kindness. 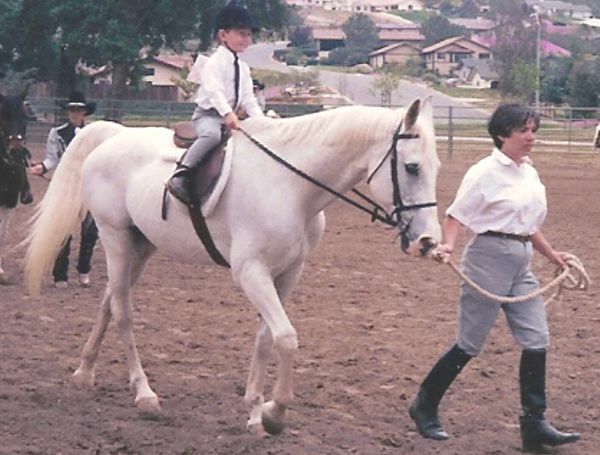 In addition, she served as a 4H project horse for a young lady (pictured) who loved horses but unable to keep a horse. Growing up horse crazy and horseless myself, I knew what it meant to be able to have a horse in her life. I had Hope until she was a few weeks over 30 years of age. Next came Miss Triton, a western bred Morgan mare. She was 19 years old when I got her. But she quickly became my best buddy and probably was the most opinionated horse I’ve ever owned. She was VERY forward & feisty, loved to kick up her heels, very competitive and FAST! But she was extremely perceptive & built confidence in every horse & rider she accompanied on the rugged California & Arizona trails. 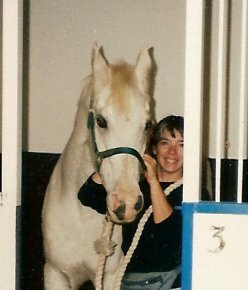 I knew her & had ridden her for many years when she was owned by a family in our 4H club. She came to me as a feed lease when her family could not afford to keep her any longer and I literally walked through fire with her. I was living in Ramona CA at the time, when the devastating Cedar Fire of 2003 swept through San Diego county. The fire started only a few short miles from my home. Miss Triton was evacuated on the run, just in front of the flames. She moved with me to Arizona & we were together until she passed just a few months shy of her 30th birthday. I now am owned by Timber, who is the most beautiful & feminine Morgan I’ve had the honor of loving. Timber is also the youngest horse I’ve ever acquired & was 17-year-old when she arrived in New River. With only one owner all her life, she had been cared for with obvious love & gentle hands. She is fearless and thinks everyone & everything she meets is just fine and of course will love her back! In honesty, except for her slow poke moments, Timber is the horse I always wanted to own. She is also a daytime napper and I really can curl up beside her and snooze with her as she curls her neck around me & snores away the day! She is 21 now & we’re looking forward to quite a few more great years ahead. For me, older horses are a blessing. Every one I’ve owned has been remarkable. They’ve been around the block more times than you know. They’ve all been pretty fearless, mainly because they’ve seen & done it all. Not much surprises them and if something new comes along they handle it with grace, unlike an equine youngster who snorts, wheels, bolts & can put their rider in jeopardy. Mine seem to love every grooming session, especially when you find their itchy spots. And they appreciate every carrot and apple. Plus, they take care of me too!